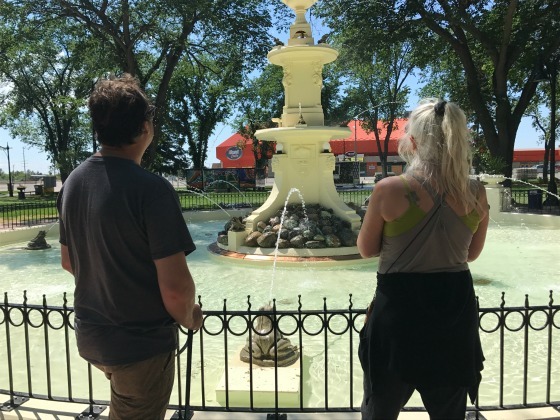 By Costa Maragos Posted: July 2, 2017 5:30 p.m.
Regina’s historic Confederation Park is experiencing a re-birth thanks in part to the work of some University of Regina artists. 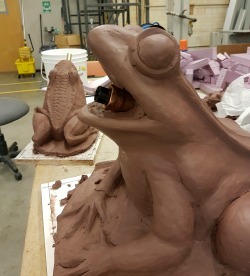 In all, the U of R artists replicated 16 frogs to replace the original water-spouting zinc frogs which had fallen into a state of disrepair. 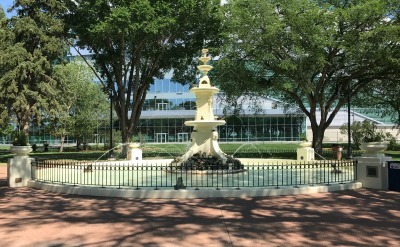 A grand opening of the park was held June 30 and at the centre of the event was the unveiling of the refurbished 90-year old fountain. The park opened in 1927, to commemorate the 60th anniversary of Confederation. Over the years, however, the park and the fountain fell into a state of disrepair and for many residents was largely forgotten. With the construction of Mosaic Stadium, the city embarked on a renewal plan for Confederation Park, located a few metres away from the stadium. The park will be the new pre-game meeting place for thousands of football fans. But for other days the park will serve as a peaceful urban oasis, particularly now that it has been brought back to its former glory. “I was honoured by the opportunity to participate in this legacy project and to leave a mark on the City of Regina,” says Olivia Rozema, who earned her Master of Fine Arts from the U of R in 2016. 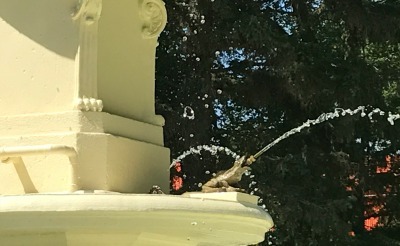 Rozema was part of an artist team tasked with replicating 16 water-spouting zinc frogs, the fountain’s crowning glory. The frogs circle the fountain in four tiers. The original pieces were in such bad shape, they had to be replaced. The other artists were Shane Crerar (BFA ’12) and Jovial Buenavente and Kasia Solomon, both current BFA candidates. The Confederation Park fountain work is part of a larger renewal that includes trees, shrubs, and benches designed according to the park’s original design. The artists worked under the direction of Sean Whalley, Assistant Professor of Visual Arts who teaches sculpture in the Faculty of Media, Arts, and Performance. “This was a wonderful opportunity to involve students in a legacy community project and to mentor them as emerging professional artists,” says Whalley. 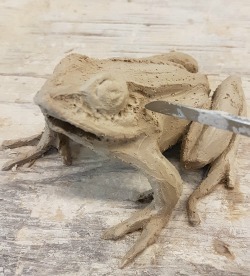 The team took on the task of modeling and making the molds of three different-sized spitter-frogs, which were cast in concrete. The artists determined the amphibians would be modeled on Saskatchewan varieties. Department of Biology. Somers helped the artists identify native Saskatchewan species of aquatic frogs and discuss their size and appearance. 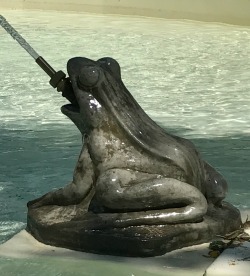 Featured in the fountain are replicas of the Western Chorus Frog, Northern Leopard Frog, and the Wood Frog. Rozema says the little Wood Frog is an apt metaphor for people in the province. 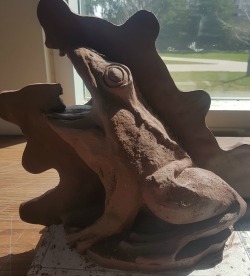 Kasia Solomon created the second tier Western Chorus frog sculpture. The U of R team started working on the project in January 2017 which included partners: The City of Regina, PCL Construction Management, AECOM Architects, Cindercrete, Neil Balkwill Centre and the Faculty of Media, Art, and Performance. The renewal project includes new trees, shrubs, and benches in accordance with the park’s original design. Modern conveniences including an irrigation system and pathway lighting have also added new life to one of the city’s oldest parks.